A lady’s purse is her mysterious source of power, and one could never presume to guess the contents. A common assumption would be that a woman’s purse only contains cosmetics, but I tend to keep an array of items that will keep me prepared for any number of adventures! Here are some of the items you will often find in my handbag on any given day! Young Living Breathe Again is a pure distilled essential oil blend containing four types of Eucalyptus oils, Rose Hip oil, Peppermint oil, Blue Cypress oil, Copaiba oil, and Myrtle oil. You may roll the oil on your face, neck, and chest, or simply hold beneath your nose and inhale. Not only does the blissful aroma leave you feeling clear and refreshed, it has immense medicinal effects, supporting respiratory health and lung function. This oil blend is a must-have if you live in an area with allergens like mold or pollen are prominent. Papaya Enzymes promote healthy digestion and help your body absorb the nutrients from the food you consume. Chlorophyll is an antioxidant superfood that fights cancer, improves liver detoxification, speeds up wound healing, improves digestion and weight control, and maintains healthy complexion! This yummy chewable supplement will keep you looking and feeling great, and is wonderful to have on hand if you find yourself often eating exotic cuisine. My Bushnell Legacy Binoculars are basically my best friend. I don’t often leave home without them. If you’re a bird lady like me, or simply enjoying site-seeing, you should consider keeping a pair of travel size binoculars in your handbag! If you can’t always bring your camera along, holding your mobile phone lens up to the lens of the binoculars will do a fine job of capturing far off wonders! The Joby Phone Tripod helps me take amazing videos and pictures wherever I go! Whether I want to film a yoga sequence, or am backpacking alone and don’t have a companion to snap a photograph, the Joby easily clips in my iPhone for great footage! This little tripod is small, flexible, and lightweight, hugging onto nearly any surface. As a writer, photographer, designer, and absolute music and film fanatic, it’s essential for me to have a way to transfer data at all times! For conducting business this keychain flash drive is key, but it can also come in handy if you meet a new friend at a coffeeshop and want to exchange some tunes or films! This gorgeous Tulum clutch by Teysha is wonderful to store my passport, cash, coins, and any other small items I want to keep safe! The Chambray pencil and accessory case by Bunglo, lined with Mountain Flower fabric, detailed with vintage gold ribbon. Nemat Indian Jasmine Oil is my favorite fragrance to wear. Jasmine is sweet, spicy, earthy, and sensual. When used in aromatherapy, jasmine has an incredible array of medicinal benefits such as acting as an antidepressant, antiseptic, aphrodisiac, antispasmodic, sedative, and aids in reducing anxiety. Palo Santo emits resonant aromas of citrusy sweet, earthy tones, making it a sublime enhancement for any environment. Native to Mexico, Central and South America, Palo Santo has been utilized ceremonially for ritual cleansing, purifying, prayer, and healing for thousands of years. NARS Pure Radiant Tinted Moisturizer with SPF 30 is essential to my daily beauty routine if I find myself out and about under the sun. I often wear a sun hat, but this amazing lightweight cream will protect the delicate skin on your face, and give it a warm glow! I find that most sunscreens clog the pores on my face making me breakout if left on my skin for several hours. That makes it quite difficult to choose between protecting my skin from harmful UV rays, or keeping my skin free and clear of oils and chemicals that will cause blemishes. This NARS product is very mild, and has had no adverse effects on my face so far! “Unicorn Pee” in Exquisite Mint Cupcake. Sooth your lips with sweet tingling natural ingredients including cocoa butter, jojoba oil, organic coconut oil, organic peppermint, organic sunflower oil, beeswax, and organic vanilla flavor. A tool for every need! You never know when you need to repair, toggle, inspect, or dissect something along your path! This extra long, braided rope iPhone charger is really a life saver. When working remotely from a cafe, you can’t always find a seat located close to a power outlet. Additionally, in most bedrooms, you will often find the position of the bed is not conveniently located in relation to a power source. Having the extra long, durable cable gives you freedom and flexibility to keep your mobile device nearby while charging. Ever since my beloved Grandmother first bought me a Smithsonian Appointment Book, I haven’t found another that I enjoy more! The Smithsonian Appointment Book gives you daily, monthly, and yearly details for capturing your plans, and features photographs of fine art, world maps, and many other useful tools for connoisseurs of travel and culture. 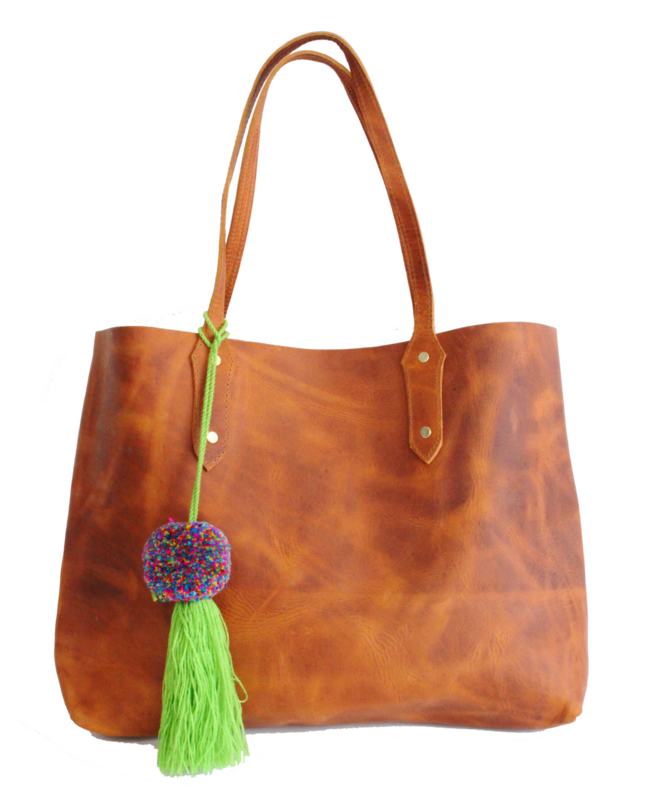 This smooth, dreamy handbag was handcrafted by artisans in Panajachel, a village alongside Lake Atitlan in Guatemala. It is both feminine, and subtle, versatile enough for business, travel, and casual outings. It’s spacious enough to fit your laptop, books, and all of your daily needs! What do you keep in your purse? Send us links to your favorite items!